Take control of your life and ask for help! Do you feel powerless over your drug of choice? Has life become unmanageable? You&apos;ve come to the right place. At New England Psychiatric Consultants, our doctors can help. "New England Psychiatric Consultants have over 20 years combined experience in the professional treatment of chemical dependency. We offer premiere psychiatric services for people struggling with substance abuse, chemical dependency, or dual diagnoses.Our doctors are licensed prescribers of suboxone&vivitrol injections for opioid addiction. We offer discreet, innovative, outpatient services. Our goal is to help you build the necessary tools needed to deal with life&apos;s inevitable challenges and improve the quality of your life. " Do I Really Have an Addiction? Asking for help is the bravest thing you will ever do. It&apos;s never easy, but it is the first step to recovery. The first stage of addiction is dependence, at which time the body must have the drug to avoid physical and psychological withdrawal symptoms. An addict eventually develops tolerance, which forces the person to consume larger doses of the drug to achieve the same affect. • An inability to consistently abstain? • Impairment in behavioral control? • Cravings for your substance of choice? • Diminished recognition of significant problems in your behaviors or interpersonal relationships? • A dysfunctional emotional response? If you identify with these symptoms, it is never too late for a new beginning. Contact our office to start down the road to recovery. We will help you regain control of your life one day at a time. If you are struggling with alcohol, marijuana, cocaine, crack, ecstasy, heroin, methamphetamine, inhalants, or prescription pain killers, recovery is possible. • Outpatient treatment based out of our private medical office. • Opioid and/or alcohol detoxification and maintenance using suboxone & vivitrol. • Individualized counseling utilizing both 12-step and non-step treatment recovery models. • Complex pharmacotherapy for patients with both an addiction history and mental health diagnosis. Our doctors at New England Psychiatric Consultants are fully licensed by the DEA to prescribe suboxone for outpatient treatment of opiate addiction.Whether opiate addiction being heroin, vicodin, or oxycontin makes little difference to the effectiveness of suboxone treatment. Administered either as a pill in a sublingual film, suboxone has helped many people and their families recover from even the worst opiate addictions. Suboxone is a preferred treatment for opioid addiction because although it suppresses withdrawal symptoms and cravings, it does not produce feelings of euphoria. Furthermore, it blocks the effects of new opioids entering the system for 24 hours. We are fully licensed by the DEA to prescribe vivitrol for outpatient treatment of opiate addiction.Vivitrol is an injectable medicine that works by blocking the opioid receptors in the brain which are responsible for feelings of pleasure. Vivitrol is a once-monthly intramuscular injection. When combined with psychological therapy, vivitrol can provide relief in the recovery process. Probuphine, the first buprenorphine implant for the maintenance treatment of opioid dependence is now available at New England Psychiatric Consultants. Probuphine is designed to provide a constant, low-level dose of buprenorphine for six months in patients who are already stable on low-to-moderate doses of other forms of buprenorphine, as part of a complete treatment program. Ask your doctor for more details! Sublocade, the first once-monthly injectable buprenorphine product for the treatment of moderate-to-severe opioid use in adult patients who have initiated treatment with a transmucosal buprenorphine-containing product. It is intended for patients who have been on a stable dose of buprenorphine treatment for a minimum of seven days. Ask your doctor for more details! Ketamine was approved by the Food and Drug Administration 56 years ago. It has a powerful ability to anesthetize humans and animals quickly and safely. In the past 20 years the medical community has found that Ketamine is an effective alternative treatment for depression and certain chronic pain conditions. Ketamine appears to restore nerve conduction in the brain that has been depleted or damaged by depression. Contact info. Can Ketamine really help my chronic pain? Some patients with mood disorders report improvement in symptoms within one hour of their first infusion. Many patients notice immediate and dramatic relief from intense suffering and hopeless feelings. Others notice improvement the next day or after their second or third infusion. Will I require Ketamine infusions for the rest of my life? Not necessarily. The first series of infusions are recommended 1-2 times per week. After the first series of ketamine infusions, treatments are often spaced apart by several months.A maintenance plan requiring return visits will be determined on an individualized basis. The outlook is very promising for patients who combine ketamine infusions with antidepressants and therapy. You must not eat solid foods for six hours prior to the scheduled infusion. Clear liquids are allowed up to two hours before therapy begins. Although you can attend the infusion alone, you must have someone you trust bring you home. You should not operate a vehicle, heavy machinery, or make any important decisions until the following morning. What should I expect at my Ketamine infusion? Please plan to be at the ambulatory surgery center for at least 60-90 minutes total. 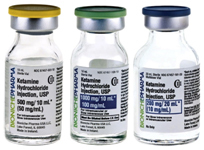 Ketamine is administered relatively quickly, over a 40-45-minute period of time. You will be awake and probably able to interact with people around you. Most patients tolerate mild side effects without discomfort, but our medical team will monitor you for another 30 minutes after the procedure. You should not drive a vehicle or make any major decisions for 24 hours following the procedure. Where will I receive my ketamine therapy? Will my medical insurance cover ketamine therapy? At this time insurance companies are not providing coverage. However, each procedure only costs $650. What is a Stellate Ganglion Blockade (SBG)? A stellate ganglion blockade is one of the latest medical breakthroughs believed to eradicate symptoms of PTSD. The SBG boasts rapid, dramatic, long term improvement of extreme PTSD symptoms. The SBG is a nerve block injection near the anterior aspect of the C6 vertebrae. Although the local numbing effects of the nerve block last only three to five hours, psychological relief or pain relief can last up to several months after the injection. Positive, life-altering changes can occur, including the reduction or elimination of suicidal thoughts, depression, and/or anxiety. The stellate ganglion is a collection of nerves found near the sixth and seventh cervical vertebrae. These nerves are responsible for chronic pain states, and the neurons release the neurotransmitter norepinephrine. Norepinephrine helps regulate the brain and body for action. For example, norepinephrine release is lowest during sleep to promote rest, and highest during stress and danger to promote arousal. PTSD can occur after someone has either witnessed or experienced a traumatic event. It is thought that trauma may lead to an increase in nerve growth factor in the stellate ganglion. When there is an overproduction of these sympathetic nerves, norepinephrineis increased, leading to feelings of anxiety. It is theorized that SGB helps reduce the nerve growth factor, reversing PTSD symptoms. Some patients experience significant relief after only one treatment! A new partnership that is changing medicine and changing lives. At New England Psychiatric Consultants, Dr. Smith and Dr. Bugaoan are proud to partner with anesthesiologist Dr. Gannon for the treatment of PTSD. Our psychiatrists utilize psychotropic medication and therapy to alleviate symptoms, while Dr. Gannon administers the stellate ganglion blockade (SGB). New England Psychiatric Consultant works closely with Dr. Gannon to ensure each patient&apos;s comfort and optimize the chances of a successful procedure. We collaborate on comprehensive pre and post evaluations and individualized treatment plans. How Do I Prepare for the Stellate Ganglion Blockade (SGB) Procedure? • Do not eat food eight hours prior to the appointment. • Do not drink any liquids three hours before the appointment. • Please discontinue pain medication four hours prior to the procedure. • If you take blood thinning medicationcheck with your prescriber about the safest way to discontinue its use prior to the procedure. • If you have insulin-dependent diabetes, please inform Dr. Gannon immediately because your dosage of insulin may need adjusted on the day of the procedure. • You may continue to take all other medications as prescribed with a small sip of water. What Happens During and After a Stellate Ganglion Block? On the day of the procedure an intravenous (IV) line may be placed in a vein. Under live x-ray guidance, Dr. Gannon will insert a small needle into the anterior portion of the C6 vertebrae. Ultrasound is frequently used to ensure precise placement of the needle. After the procedure is complete you will need to remain at the office for observation. To reduce swelling or discomfort, apply ice on the day of the procedure, and moist heat on the day after the procedure. Your voice may be hoarse for a short while, but it should quickly return to normal. You will need to drink sips of water through a straw the first three hours after the procedure. You may resume normal activity as soon as the block wears off. Your insurance provider may cover the procedure if you qualify by having been diagnosed with certain chronic pain conditions such as post complex regional pain syndrome, herpetic neuralgia, occipital neuralgia, or trigeminal neuralgia. Otherwise, the out-of-pocket expense for the procedure is $500.